Peattie was born in 1898 and died in 1964, and his masterpiece, written in the late 1940s, is A Natural History of Trees. It has two parts—one on Eastern and Central North America, the other on trees of the West—and it covers hundreds of species. He was a botanist and is accurate and complete, but these are also wonderful portraits. Part of what makes the book such a pleasure is his attention to the effect that a tree has on the people looking at it or sitting under it. 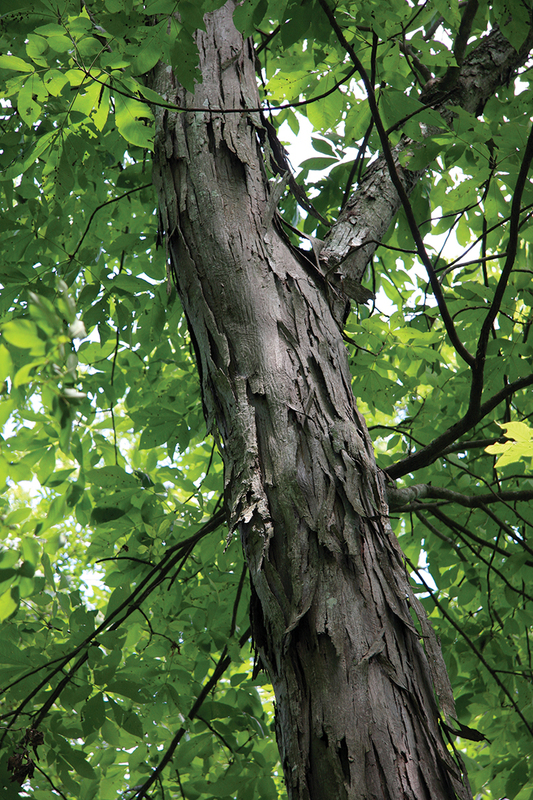 There are a dozen hickory species native to North America, but the shagbark (Carya ovata) is obviously his favorite. The usual textbook description tells us the tree has compound leaves, with a five-fingered look. Peattie correctly observes that winter and early spring are the shagbark’s best seasons. Its female flowers in April, with male catkins, are noted and praised, and the tree is said to have impressive fall foliage. Wrong. Those flowers and catkins are barely visible. The allegedly good fall display is a dull yellow-brown and the leaves are often speckled brown. Some years the leaves turn a sullen brown and drop off early in September. In its barer seasons, the plates of bark, more than a foot long, about six inches wide, and curling at both ends, seem interestingly warped. (They’re attached at the middle, and it would be hard to pull them off.) There are loads of trees with exfoliating bark, but few or none with these big segments. What is most impressive, and rarely mentioned in contemporary tree books, is the shagbark’s emerging foliage: “But about the first week in April the inner bud scales begin to open, arching out and twisting at the same time, but with their tips at first still adhering in a pointed arch. Shining and downy on the inner surface, and yellow-green richly tinged with red, they look like petals of some great tulip or magnolia as finally they part and curl back. The young leaves and catkins are then seen standing up in a twist, like a skein of green wool.” Peattie, whose works are being reissued, studied French poetry his first two years at college before turning to botany. He has a sort of romance with this tree (and others); his language is affectionate and sensuous. The shagbark is one of those trees, like an ancient weeping cherry, with flowers or tender foliage shown to advantage against textured, aged-looking bark. The shagbark’s nuts were important food for Native Americans. They’re tasty, though small. The thick green four-sectioned husk turns dark, splits, and drops in the fall, when it’s food for game birds such as wood ducks and turkeys. Pig farmers are the people who intentionally plant a shagbark. The nuts are part of the mast that pigs favor. Thinking of the famous hickory-smoked ham, there’s a connection—pigs that grew fat on hickory nuts have their meat cured over a hickory wood fire. And, of course, there’s Andrew Jackson, known as Old Hickory. In 1830, he planned his tomb (he would die in 1845), placing six shagbarks around it. Constance Casey, a former New York City Parks Department gardener, writes on natural history for Bloomberg News and Slate, as well as LAM. I love stories like this! Thanks for sharing this amazing story with us! Regards! That’s a wonderful informative fact on shagbark hickory.These trees have their own uses as well. For example, Shagbark hickory wood is used for smoking meat and for making the bows of Native Americans of the northern area. The lumber is heavy, hard, and tough, weighing 63 lb/ cu ft when air-dried and has been employed for implements and tools that require strength. These include axles, axe handles, ploughs, and skis.